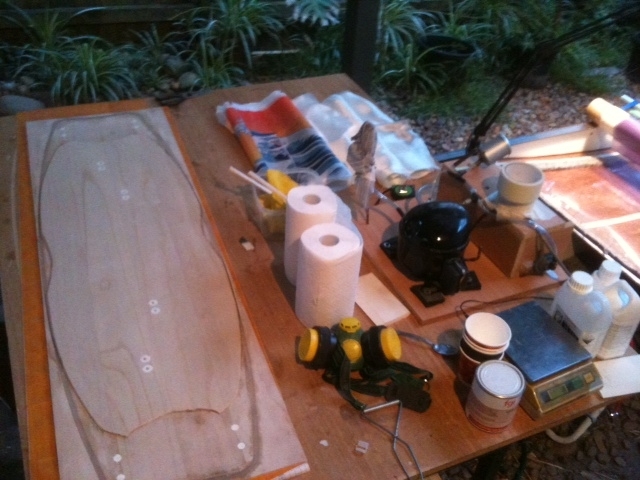 We had an unexpected break in the weather and so yesterday I took an early mark and got board #3 onto the rocker table. Overall things when smoothly with the exception of the rocker table surface which deformed under the pressure required to get the concave into the board once the rocker had applied. First thing was to assemble the rocker table and clamp it tight with the ratchet straps. Note the rocker table surface is 4 mm perspex over 4 mm ply wood. The perspex in this clamp style rocker table bends sharply over the middle jig and so the smooth 'beam' bending on which the rocker calculations don't work and you end up with a 'triangular' concave rather than the (almost) parabolic profile. Ratchet straps worked well, The metal pole over the top was just to assist applying clamping pressure to the jigs in the middle where the greatest force is needed. It didn't get in the way too much because there was a lot of clearance under it. Next I sealed the core with resin. Couple of reasons for this. Firstly, I want a white background for the graphics on the underside and secondly the wood drinks in quite a bit of resin and I have read that this can also lead to air bubbles in the laminate (though with temperatures falling its more likely to be drawing air and resin into the core rather then expelling it). It took around 100gms of resin to do both sides. The as the pigmented resin did soak into the core the coloration became a translucent white with wood grain showing through. I was wanting opaque white but it was not to be. Then to the layup. 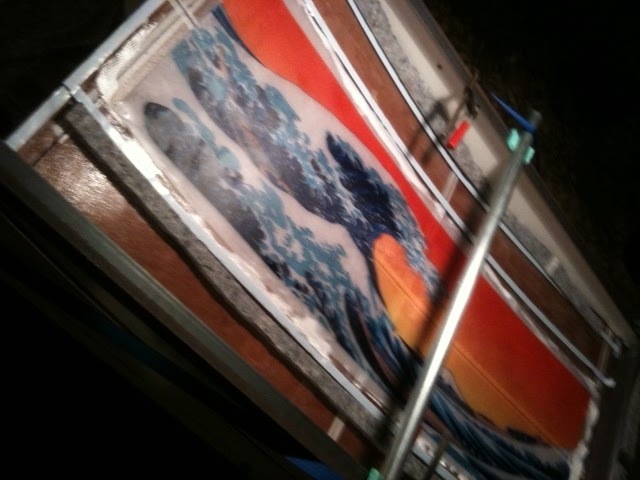 I'm using 200gm e-glass 0/90 degrees. Two layers both sides. The resin/fibre ratio for this is around 50% so given the board size I figured that the ideal would be around 200gms resin per side + 10% for excess required to saturate the glass. This turned out to be spot on even with the decal insert. On the bottom, I put the graphics in between the 2 layers. The material the graphics is printed on is like thin peel ply and so as soon as it touched the resin it started to wick it up and it saturated with almost no pressure being applied. I did pour some extra resin on it to make sure. Any excess here will be drawn into the next layer of glass and excess beyond that will be sucked out under vacuum. ﻿﻿ Then the core and top 2 layers plus the footpad reinforcements. I am not very quick with the resin work and so but this stage it had been over 50 mins since the first layer of cloth was wetted out. Fortunately I was using slow hardener ( 35 min pot life but much longer once you spread it out and the heat generated by the curing does not speed the curing process up) and it was a cool night so it was still very workable. I was worried that it may have gone too viscous to effective squeeze out the excess resin but it did seem to be an issue based on the amount of resin that came out. I used loads of paper towels as the breather/bleeder material and it works fine. In addition I used carpet felt underlay cut into strips and placed around the perimeter of the board to keep the air channel open so that the vacuum would be applied evenly around the board. This stuff works great. ..... 27 inHg vacuum pressure. Initially the vac pump engaged every 1-2 mins ﻿once it reached 27 inHg. I thin part of this is the lines in the pneumatic circuit distorting ( I'm only using fairly soft plastic hoses) and part was small leaks due to glass fibred draped across the tacky tap. I went around a pressed the film into the tape and also run a line of packing tape around the edges of the film. Because of the short duration of the starts the relay on the pump did not have time to reset properly and so the pump was not reengaging when the micro switch on my regulator closed but rather only when the relay on the pump reset. I was a bit worried about this but fortunately the seal got better and the restarts reduced to every 15-20 mins. excellent effort! It will be interesting to see a spring back after a while since the ply were glued straight. On my board two ply's are working as they want! :) Depending on humidity since not sealed. Yours might be different with water trapped in the wood. But than even on a test run with 1 layer glass it's drinking varnish meaning at least 3-5 varnishing to seal it completely. Hm...Will this ever be sealed and water trapped and what will happen on 40C+ temperature in ie. a car?